A warranty deed is a legal document used to transfer, or convey, rights in real property from a grantor (seller) to a grantee (buyer). This type of deed provides protection for the grantee by confirming that the grantor holds clear title to the real estate and has the right to sell the property to the grantee. This guarantee extends throughout the property's history. The grantor also warrants that they did not encumber the property in a way prohibiting transfer, and that the deed references all easements, restrictions, or other agreements of record that relate to the specific parcel of land. A lawful warranty deed includes the grantor's full name and marital status, as well as the grantee's full name, marital status, mailing address, and vesting. Vesting describes how the grantee holds title to the property. For Illinois residential property, the primary methods for holding title in co-ownership are tenancy in common, joint tenancy and tenancy by entirety. A grant of ownership of real estate to two or more persons creates a tenancy in common, unless a joint tenancy or tenancy by the entirety is specified. (765 ILCS 1005/1, 1005/1c.). As with any conveyance of real estate, warranty deeds require a complete legal description of the parcel. Recite the source of title to establish a clear chain of title, and detail any restrictions associated with the property. All warranty deeds must comply with state and local recording standards. Once acknowledged or proved and certified as provided, record the deed in the recorder's office in the county where such lands are located. 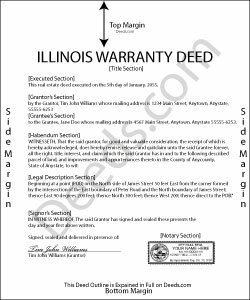 If a warranty deed is acknowledged in Illinois, acknowledgements may be taken before a notary public, United States commissioner, county clerk, or any court, judge, clerk, or deputy clerk of such court. When they are taken before a notary public or United States commissioner, they must be attested by his or her official seal; and if taken before a judge or clerk of a court, the acknowledgements must be attested by the seal of the court (765 ILCS 5/20). Include all relevant documents, affidavits, forms, and fees with the along with the deed for recording. Pursuant to 35 ILCS 200/31-10, documents conveying real property are subject to a documentary transfer tax. An Illinois Real Estate Transfer Declaration is required (35 ILCS 200/31-25), unless an exemption is claimed. See 35 ILCS 200/31-45 for a list of exemptions. A Notarial Record Form is also required, unless an exemption is claimed. A list of exempt conveyances can be found on page 1 of the Notarial Record Form (5 ILCS 312/3-102). Some Illinois counties require a Plat Act Affidavit of Metes and Bounds pursuant to 765 ILCS 205/1 with all deeds, assuring that the land has not been divided or identifies specific types of division according to the plat act. Contact the local recorder with questions about supporting document requirements. This article is provided for informational purposes only and is not a substitute for the advice of an attorney. Consult an attorney for more details about warranty deeds or other issues related to the transfer of real property.